Since I posted my Easter layouts yesterday I thought I would go ahead and post the other two layouts for the contest today. This way if any of ya'll are watching the HSN E2 shows that start at 12:01 AM EST tonight you can help me look! Make sure you scroll all the way through since there are two layouts posted. This was the last layout I made for the contest. I put it together fairly quickly and thought I would go with a boy theme since I never do those. I think it would look a lot better with a picture on it but it was in the rules that no pictures were to be included. I focused on using only one cartridge for this layout. I wanted to showcase how one cartridge can do the job when necessary *but okie thinks that is utter nonsense since she believes diversity is the spice of life...or at least papercrafting*. 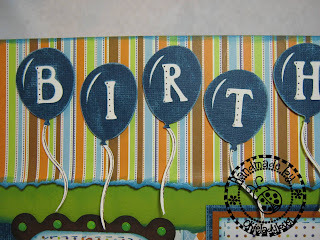 I sanded the Core'dinations cardstock before putting it in the Cricut to cut for the balloons. I used a paper towel to wipe off any "paper dust" from the sanding. 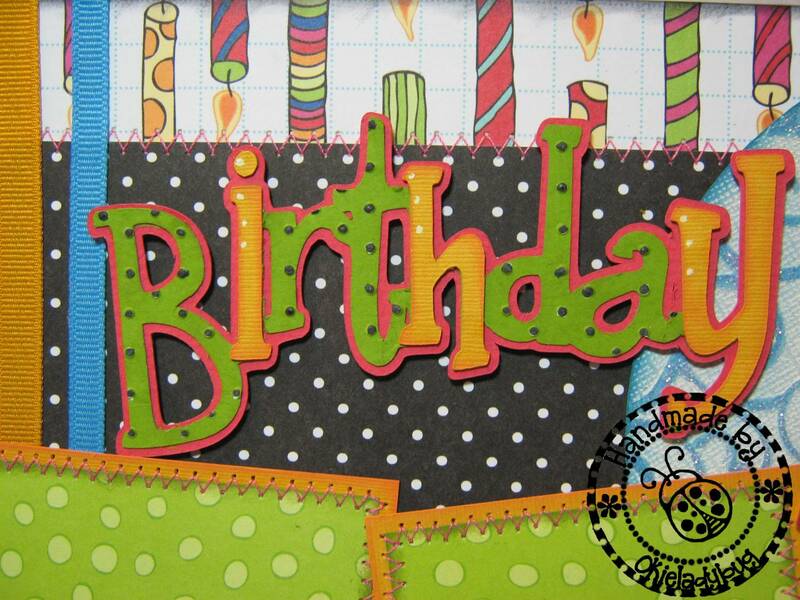 I used the hide contour feature in Design Studio so I could have a solid white base for the balloons, this provided a good background for the cut out letters. 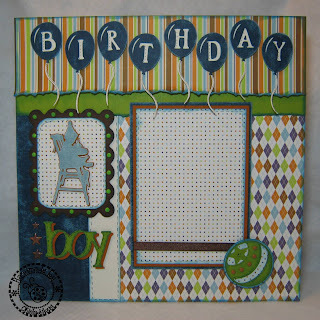 I cut off the "strings" from the blue balloons before adhering the layers together. 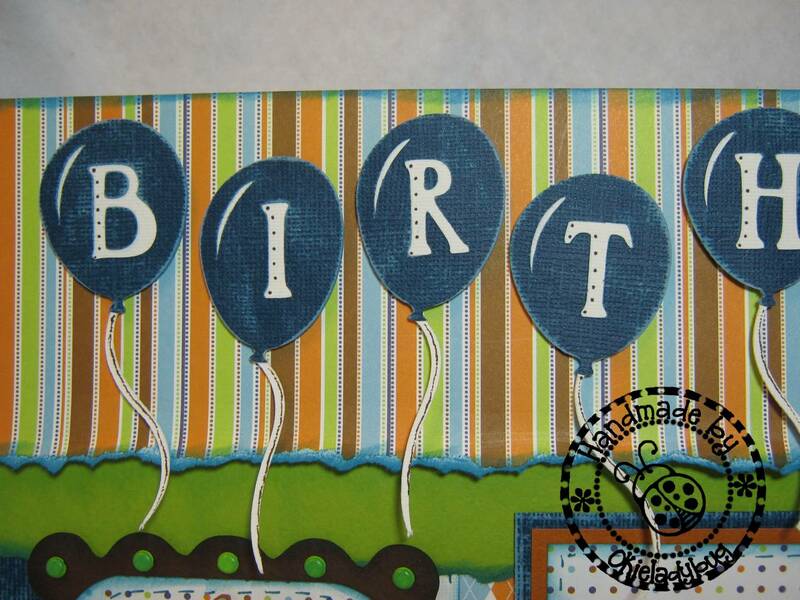 I used a blue marker to dot the white letters and a brown to run along the white string of the balloon. I wasn't sold on A Child's Year for a long time but when a friend of mine found it pretty cheap I had her get it for me. I did like the font that is included and thought if nothing else I could use it. But now the little silhouette's are starting to grow on me. For the child top layer I used Core'dinations and used the same method as for the balloons as far as sanding. The frame is also from ACY. Before adding the lime green brads to the scallops I tamped them on a Colorbox Chalk Ink pad and then wiped off the excess. This helped dull the bright color a little and made the brads coordinate with the papers better. I cut the "boy" twice, once with green and once with orange, so I could have a shadow *okie so does love her shadows*. I added the star brads at the end because I thought it just needed a little something there. I added a double layer of mounting foam to the ball so it would stick up enough for a photo to go behind easily. I was careful not to put the foam where the picture needed to go. The ribbon is also not adhered to the photo mat. I did the brads on the ball like I did for the ones on the scallop frame. It helped dull the color of them and make them blend in with the colors a lot better. While this is not my favorite I did I didn't think it was too bad for my first ever little boy layout *okie doesn't think she will ever be doing another little boy layout since she is surrounded by girls*. 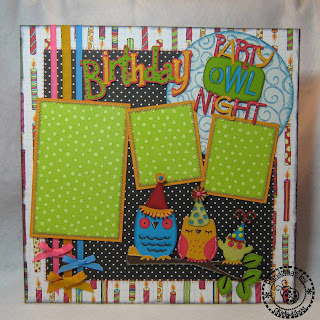 Of course the inspiration for this layout came from my daughter's sorority whose mascot is owls. I thought I could make this one again for her birthday when she celebrates with her sisters. 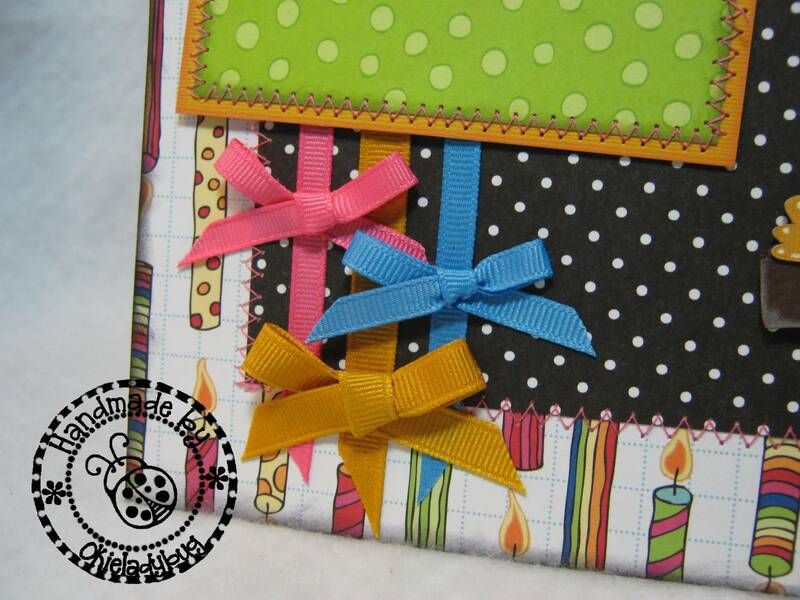 I really like the bright colors on this one and I think it would be good for a child or adult. I cut the hats from Celebrations and the owls from Hoot N' Holler. I had to really pay attention to the placement on the mat with the cardstock since I had so many colors going on but I think they turned out pretty good *okie thinks she is getting better at stepping out of her comfort zone and making things different colors than they "should be"*. 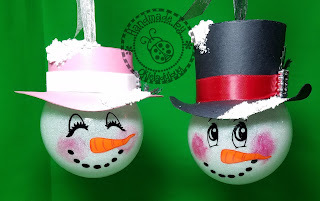 I cut the leaves on the branch twice so I could pop dot a top layer. Not sure you can really tell on the picture though. The owls sitting on the branch are on mounting foam, and I think you can tell a little bit with the shadow the big owl's hat is casting on the photo mat. 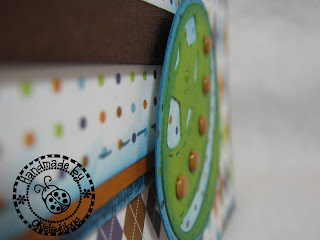 I used George to cut a circle out of Coredinations Whitewash cardstock, ran it through the Cuttlebug with the D'Vine Swirls folder and then wiped off the "paper dust" with a paper towel. I added Diamond Stickles to the swirls to give the moon a little glittery look. 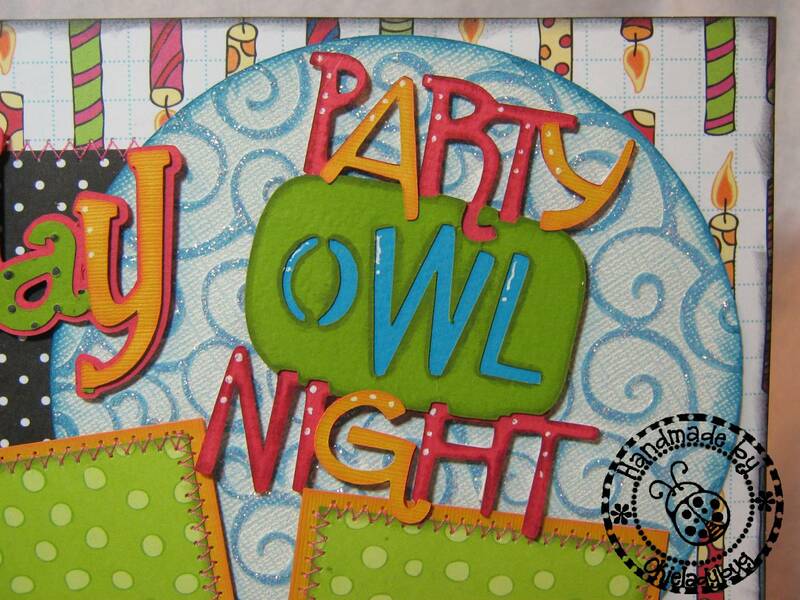 I inked and added a little white doodling to the "Party Owl Night" to make sure it would stand out enough. Sometimes with busy patterns it is easy to lose elements. 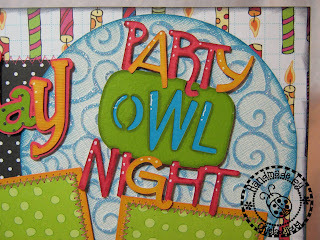 I searched through my fonts to find one that I thought coordinated well with "party owl night" and I found that I liked the font from Feeling Groovy with it and so used it for cutting "Birthday". I welded the letters using Design Studio, basically because I am too dang lazy to cut out letters individually! I did cut the "i, h, y" individually out of some light orange so the word birthday to help it blend in with the other lettering better. 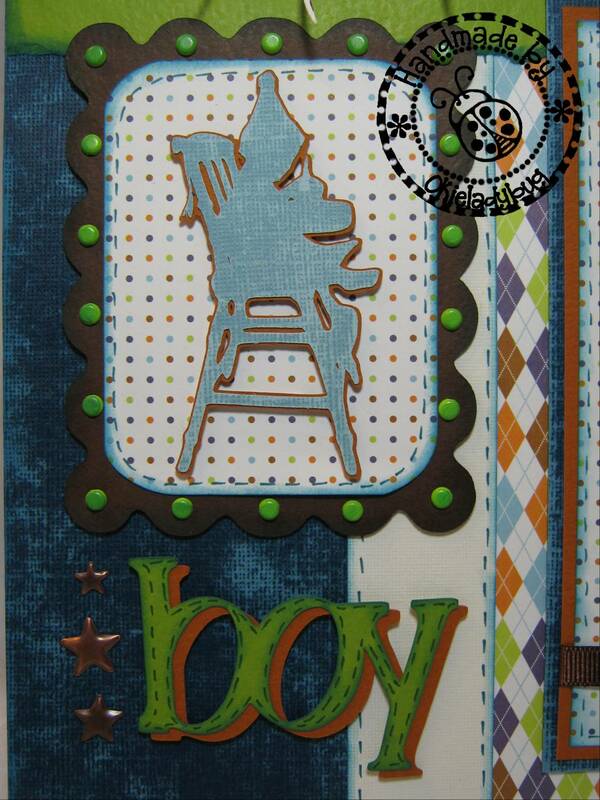 I ran the green layer through the Cuttlebug using the Swiss Dots folder and then colored the dots with black. The ribbon was actually an after thought. I got the layout ready to put together and had my elements all together with re-positionable adhesive and I just kept thinking there needed to be something on that side to help balance the layout. 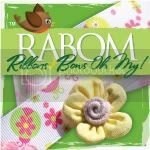 I dug through my stash of ribbon to see if I could find colors that would work. The bows at the bottom seemed to add that little something it needed. 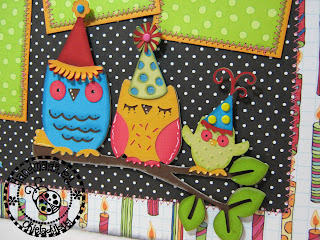 After seeing some of the other layouts that were submitted for the contest I don't think I will stand a chance on winning but at least I can say I tried and I have to admit it was fun knowing there were friends of mine entering and how we encouraged each other on the Cricut Circle messageboard forum. I love love love the owl layout!!! Well, of course both of them are amazing. Glad you decided to make them to enter. Good Luck!! Very nice! I love the birthday boy layout! 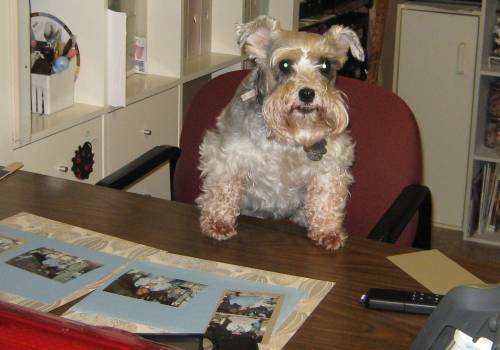 Your entries are wonderful! I believe that you have a good chance of winning. Good luck! Very nice layouts, Okie! Great job on both of them. Love the stitching on the Owl one, and the way you brought down those ribbons behind the picture mats. That's a very nice touch. Good luck with the challenge. I'll be watching! I love both layouts!!!! I'm rooting for you! I will definitely be on the look out! How exciting! I really hope to see one of yours! All your layouts are terrific, lots of beautiful work entered for the contest :) good luck! Your layouts are fabulous! I so hope you win. I'll be watching with you tonight. Good luck! Love your layouts ! Wish they'd send them to me when they were done with them !!! i so love both layouts but the birthday boy is my favorite!! and i think you are VERY talented! Okie, I like both LOs! TFS! I'll keep an eye out for both layouts tonight! they're terrific so they won't be hard to find! 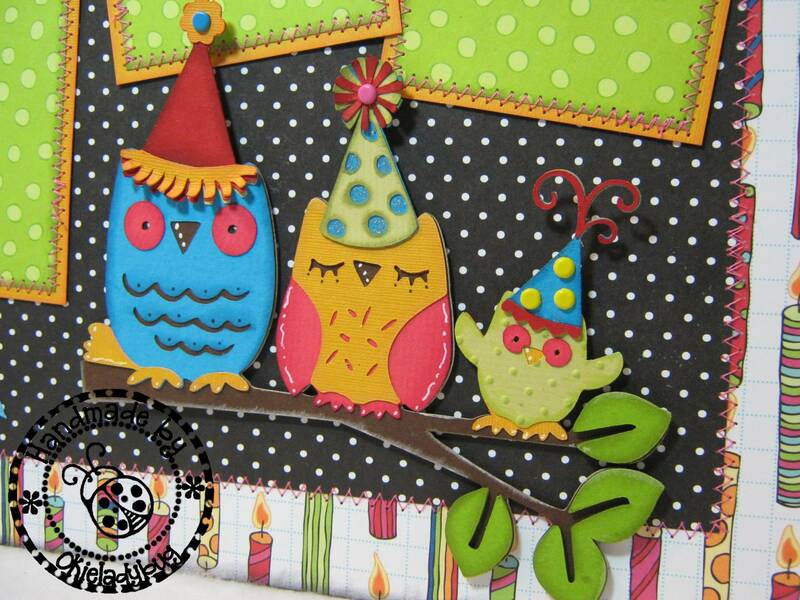 Way cute layouts love love love the owls and the color choices. I don't have any boys, but I really like your boy LO and those owls....too cute! Hope you get to see them on TV! I like your layouts. The boy lasyout is so cute for a baby boy's first birthday. The owlslayout is so bright and cheery. I'm glad you decided to enter your lo's. I love both of them, but since I've got boys in my house, the first one is my fav. I don't see many boy lo's. Love the details...TFS! I hope you win. I don't know when they post the winners, do you?? Both are really nice, but the OWL PARTY is SO GREAT! Love all the extra touches. 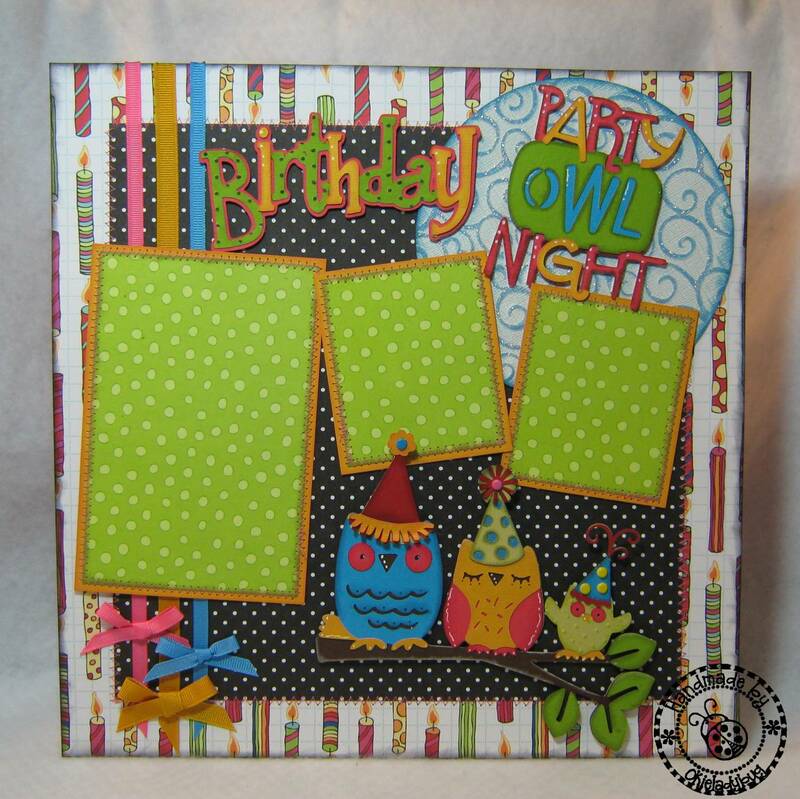 I don't have that font or cart and LOVE the Happy Birthday and the Owls, shoot, just love it all! Good Luck! Okie you never cease to amaze me with your creativity! I loooooove the owl layout! 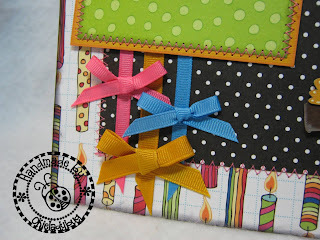 It looks perfect and you did a fantastic job in coordinating all the colors together! I love reading your posts to get inspired to create! Just saw your layouts on HSN! I think that is a good sign. Keeping my fingers crossed for you! OMG!!!! I just saw Jinger showing both of your lay outs!!! I was just checking my email and reading your post and I look up and there is Jinger holding your layout!!! Congrats!!! Way to go Okie! I saw your Birthday Boy and Picture Perfect layouts on HSN today! I love them both so much I plan to scrap lift, lol. Congratulations! I saw both of your layouts on HSN!! Great job, that's exciting! Ok I am offically disgusted your were so great you should have won! This is such a wonderful LO, Shirley! 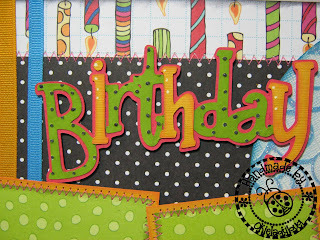 Love the colors and the tip for "dulling" the neon colors. Excellent creativity. Is your daughter a Chi Omega? Thank you everyone for the great compliments. I still have to get the .cut files on here but have been working on another project, okay projects and haven't sat down long enough to do it. Gramjak, yep she is a Chi-O, well not officially until August because she failed a class last semester. But that happens sometimes.